We all love a car with functioning air con, especially when you consider how hot it can get in a typical Lagos traffic. At bus stations, AC buses are generally higher priced than non AC buses. The last time I entered a non AC-bus from Port Harcourt to Lagos was the last time I’d try such. For such distances, comfort is very important. A car’s air conditioning unit is similar to the ones used in homes. The main difference according to this Quora post is that, the AC’s compressor is “coupled with engine’s output.” In a system like this, several problems can arise. This include the AC not cooling enough, faulty compressor, leaking refrigerant etc. Starting a car AC repair business will require sound knowledge and hands-on experience. Unfortunately, auto technicians have a bad reputation in Nigeria due to the actions of many in the business. To stand out from the crowd, you have to provide professional services coupled with honesty. Actions such as taking money for repairs you didn’t make should be avoided. Starting this business requires small capital. This is because it requires mainly expertise in the field and tools. The business can be operated as a mobile one without need for a workshop. 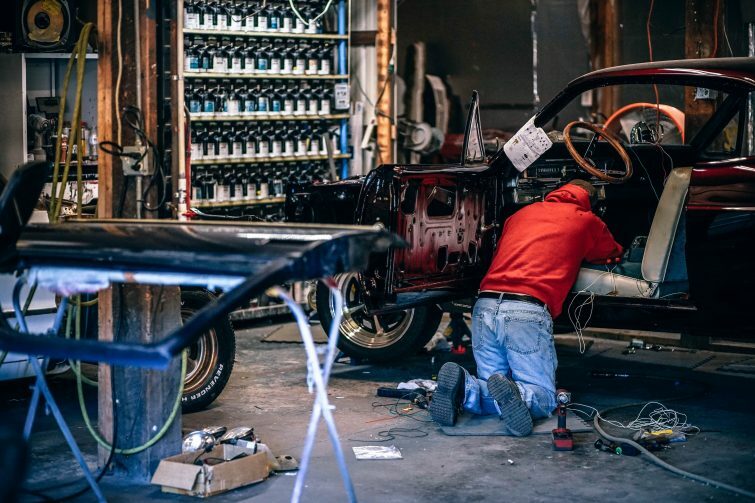 If you need a work space, you can work at the local auto workshop. What these shops do is that they allow different technicians to make use of the workshop in exchange for rent money. Toolkit required for auto AC repair include; gas, air condition diagnostic kit, leak checking equipment etc. Working as an apprentice will also provide insight on which tools are most important to start with. Where can I learn about car air conditioner repair? The best way to learn is to apprentice at a repair shop for some time. Most times, this involves paying some money. Enquire from auto workshops in your vicinity if they offer apprenticeship opportunities. Working as an apprentice has its advantage as it gives the chance of learning AC repair for different vehicles. These cars might have AC system peculiar to them and knowing how to handle different cases means a greater pool of potential customers. If you have family friends with vehicles you can start here and offer to repair for free. Encourage them to refer you to their colleagues. This model can be applied in your place of worship. Small flyers can also be made to support this move. Offer to repair cars at customer’s home/office. Another avenue to consider is to pair with car wash operators. There is a higher chance of cars using AC to use car washing services. You can share flyers to visitors. Talk to the car wash owner about your services, probably offer them a free AC check-up. Ask if they can allow you to design a ‘signboard’ and put in their premises. Microsoft Word A4-sized adverts can be pasted in the waiting area of the car wash on permission from the owner. Customers will gladly refer your services when they are satisfied with your work. Make sure the quality of your service is worth referring to others. I want to convey my affection for your kindness for women who absolutely need guidance on that situation. Your very own commitment to getting the solution across appeared to be definitely useful and has always allowed those much like me to arrive at their dreams. Your amazing insightful hints and tips can mean a lot to me and even further to my peers. Thanks a lot; from each one of us.